A new book outlining the death of Cecil the lion at the hands of an American dentist claims the animal suffered immeasurably in his last hours. Cecil the lion was killed outside of a national park in Zimbabwe in 2015 by Walter Palmer. Now a new book by lion researcher Dr. Andrew Loveridge, Lion Hearted: The Life and Death of Cecil and the Future of Africa's Iconic Cats, delves into the details around the animal's final hours. In researching the book, Dr. Loveridge spoke at length to various people in the Hwange National Park area where Cecil lived - including game staff, researchers and residents. According to the book, Cecil was likely shot by an arrow (as reports at the time claimed) and left to suffer for many hours. A passage from the book says: "Cecil suffered incredible cruelty for at least 10 hours, severely wounded and slowly dying. "Clearly, although the wound was severe, the arrow had missed the vital organs or arteries that would have caused rapid blood loss and a relatively quick death. "Certainly, the lion was so incapacitated that in all those hours he'd been able to move only 350 meters from the place where he was shot." It adds: "Judging from the events described by Cornelius and the data sent by the GPS collar, the injured lion most likely was killed 10 to 12 hours after being wounded." Media reports at the time suggested that Walter Palmer deliberately lured Cecil out of the national park in order to bypass regulations protecting the animal. The findings by Dr. Loveridge back up these claims. He also concurs that Cecil was killed by a second arrow fired from a compound bow. 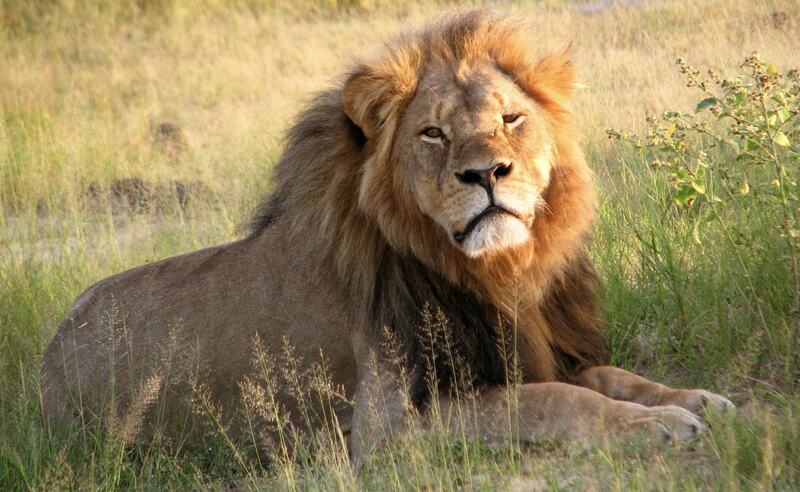 While Palmer faced public disgust and outrage, he did not face any charges over killing Cecil. PETA President, Ingrid Newkirk has spoken out about how this updated Cecil information ties into news that President Trump has backtracked on his promise to ban imports of elephant hunting 'trophies'. She said: "The new finding that Cecil - the lion who was selfishly and ineptly hunted down by Minnesota dentist Walter Palmer - suffered in agony for 10 to 12 hours before dying shows how backward and cruel it is for the U.S. to reopen its borders to 'trophies' such as the remains of imperiled lions and elephants. "The federal Government, with a White House nod, says it will evaluate import permits on a case-by-case basis, but there is simply no case in which authorizing the slaughter of majestic wildlife is an acceptable idea." Lion Hearted: The Life and Death of Cecil and the Future of Africa's Iconic Cats is released on April 10.